Angel was born with only half of his right leg as well as Syndactyly, a congenital malformation where his finger and toes were fused together. Angel’s family is very poor and live in a tin shack in the countryside; because of their poverty level, they had never had the opportunity to get Angel the medical attention and care he needed. Transitions arranged for him to see a specialist and have surgery to free his fingers. At age four, Angel had never been able to walk before and had to either crawl on the floor or have someone carry him. Transitions fitted him for a prosthetic limb, and Angel also received physical therapy. 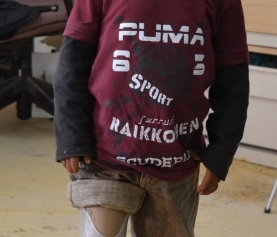 Now he can walk on his own, but since he is so young, as he grows, he will need to travel to the clinic to have his prosthetic leg adjusted and the socket refitted. He will also need to continue seeing a physical therapist. Angel’s family is loving and supportive and are being trained in homecare and exercise techniques for his maximum success. They dream of the day, a few years from now, that their son will be able walk to the one-room school house 30 minutes from their home to start his education.